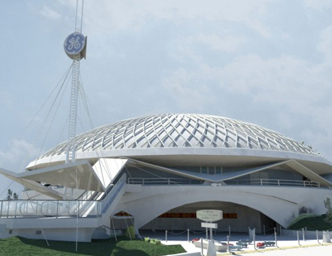 The University of Central Florida, New York Hall of Science (NYHS) and Queens Museum of Art (QMA) are developing Interconnections: Revisiting the Future – an immersive online 3D experience set in the 1964/65 New York World’s Fair (NYWF). Virtual Fairgoers are transported to an accurately modeled venue where they can freely explore more than 140 pavilions. Interconnections weaves together individual threads of singular disciplines found within the Fair into a multidisciplinary tapestry of exploration. Throughout the environment Discovery Points afford opportunities for in-depth interaction with STEM (science, technology, engineering & mathematics) topics while empowering visitors to explore the broader consequences of technological innovations. Key objectives involve instilling enthusiasm in the target audience, age 9-13 adolescents, to nurture their creativity and encourage them to pursue their own parallel and divergent lines of research. The centerpiece of user-generated content for our project is FutureFair, an area where users can let their minds create a vision of the future based on STEM knowledge acquired within the larger NYWF environment. The New York World’s Fair environment creates a virtual circle between the online and onsite locations of the New York Hall of Science and Queens Museum of Art. Each facility and experience cross-pollinates the other. Outside the NYHS stand two newly refurbished original rockets from the 64/65 NYWF, serving as sentinels to potential discoveries. However, in their current form, this potential is limited as their story and STEM content are static – children stand before them with wonder, but do they understand their operational principles and their achievements? Within QMA are space artifacts that sit passively within their archival holdings. Through the 1964/1965 virtual environment provided by Interconnections, the stories of these technological wonders and numerous related artifacts at both facilities can be fully explored and used to motivate the inquiry process.